Many of you have been waiting patiently for this day – and your wait is over! It is finally J-Day, the moment each year when Danes celebrate the coming of Christmas with the launch of Tuborg’s famous Christmas beer Julebryg – a tradition for over 30 years. While many of us in the UK are groaning about hearing the odd Christmas carol, the Danes are getting right into the spirit (or beer) of things. Fun fact: do you know that J-Day was originally on a Wednesday, but there were too many empty offices and secondary school classrooms the next day! 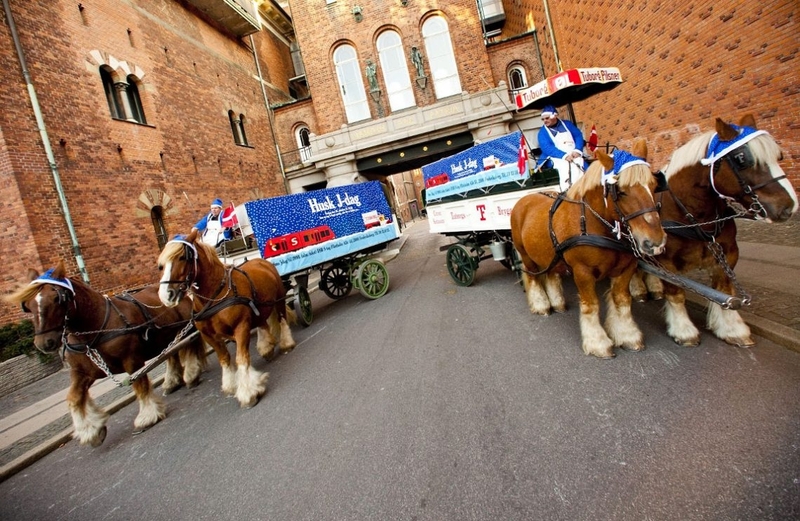 On Friday 3 November at 20:59 CET (19:59 GMT), Julebryg will begin flowing in pubs and Rådhuspladsen across Denmark as Danes, many dressed in Tuborg-blue coloured Santa hats, enjoy the limited-edition Christmas beer delivered by horse-drawn carts from the Tuborg brewery. What better way to get in to the Christmas spirit than with this festive dark golden beer with notes of English liquorice. How about serving this at your wonderful Julefrokost, it is sure to be a hit, along with some tasty herring – we have many varieties available. Tuborg’s horse-drawn carts couldn’t quite make it across the North Sea to our warehouse near Southampton, but we know Juleberg is an essential part of any Danish Christmas party – so that didn’t stop us getting it for you. Besides, we have heard so much about how wonderful this beer is we could not wait to try it for ourselves; but don’t worry, we will be fit and ready to ship out your orders on Monday. Through our courier we’ve imported one of the UK’s largest stocks of Tuborg Juleberg! You can purchase individual cans or packs of 6, 12 or 24. Juleberg is only available from the brewery for 10 days. Our stocks are limited - and when it's gone, it’s gone – there is no more until J-Day 2018! Why not enjoy your Tuborg Julebryg with other Christmas favourites such as Toms Chocolate Snowballs (well we had to give you some snow somehow, and this way is much warmer and tastier) and Anthon Berg Marzipan Bites with Nougat. See our Christmas page for these and more! We hope you have a fantastic J-Day! Glædelig jul og godt Tub'år.